Since when are vending machines part of our everyday lives? The first modern vending machines were introduced in the US towards the end of the 19th century. What has changed since then? In most cases, not that much: internal mechanisms have been made more efficient, traditionally coin operated machines started accepting banknotes and later on magnetic keys, but of the nearly 7 million vending machines currently deployed in the US, 90% are just a slightly updated version of what we could have observed a century ago. What about the remaining 10%? What makes them different? The difference lies in a magical word that is being added to the term vending machine: smart (sometimes intelligent). The key factor is bringing the machines online. As a result, the units can communicate in real time with a centralized control platform that receives real time data flows on functionality, warehousing, sales and much more. The integration of a number of modern sensors adds further value to the above. As an example certain sensors can be used to control temperature levels within the machines, in some cases differentiating by zones or warehouse modules. This allows operators to meet varying temperature demands for a range of different products and to intervene immediately in case if malfunctioning. Moreover, sensors can pick up and communicate errors in product pickup and delivery, enabling the machines not to charge for miss-vends or to handle returns when necessary. Further value is added to the maintenance and replenishment process: especially for companies managing a large fleet of machines, receiving instant data feeds on all machine functionalities is key. Knowing which machines need fixing or replenishment in real time minimizes downtime and optimizes logistics saving both time and money. In the long run, data collection of a fleet leads to a big data source that can be used to create an optimized preventive maintenance schedule to exchange parts just before they break. A stable internet connection enables the smart vending machines to accept any payment system that requires real time verification such as credit cards, PayPal and virtual wallets. On top of that, payment and product pickup can be deferred, giving consumers the possibility to buy products through their smartphones, maybe on their way home and pick up the bought items from the machine next to their doorstep. Since the connected machines are also able to download contents, digital signage screens can be updated in real time, creating a remotely controllable, fully customizable digital shop window. This can be leveraged to increase sales: think of a machine able to show different sets of sunglasses during a sunny morning, to then switch to a range of umbrellas during the rainy afternoon of the same day. Thanks to increasingly efficient connections, given the right hardware, the consumer can be connected with a shop assistant, that may be located hundreds of miles away but still able to create a personalized and engaging shopping experience through a videoconferencing system. Cameras can also be used for facial recognition and augmented reality: a cosmetics company for example, might want to show consumers how they would look wearing a certain makeup or be able to recommend which face cream to use for a certain skin type. The consumer can then judge the outcome from the virtual mirror and instantly buy the chosen product. We have already spoken about a similar application introduced by a top-notch retailer such as Sephora. In some cases, it might be interesting to create a Wi-Fi hotspot and share the smart vending machine’s internet connection with the passerby. 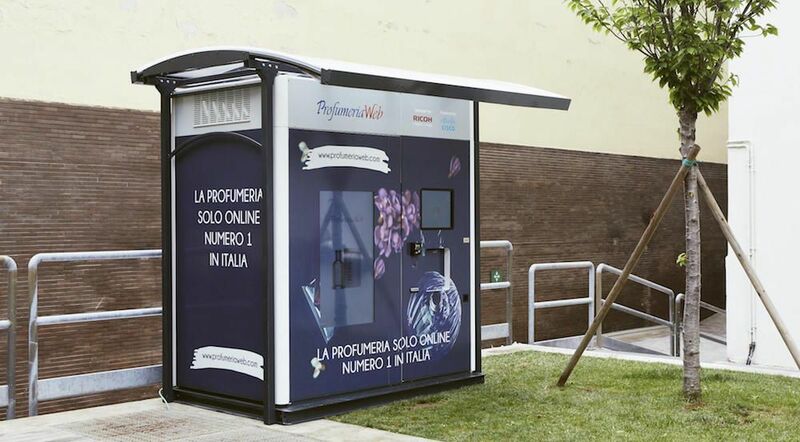 This enables the automated retail operators to engage nearby people through their smartphones opening the door to an infinite way of possible interactions. A good example could be the engagement of leads though gaming experiences. Winning or downloading a game might give a chance to win a product available in the smart vending machine or a discount coupon for future purchases. These personalized offers are certainly better displayed on a private phone than on a public screen. The above mentioned technologies (and many more we haven’t written about) are able to radically transform human interaction with vending machines, improving the shopping experience from all angles both for the consumer and retailer. We don’t need to forget that we are talking about a crucial moment of contact during which a consumer forms their opinion on the brand or brands they are currently interacting with: a consumer electronics retailer using a “traditional” vending machine as go to market strategy will hardly be able to communicate the sensation of representing cutting edge technology. If in modern automated retail customer experience is king, taking the mentioned features into account is key for any successful deployment.